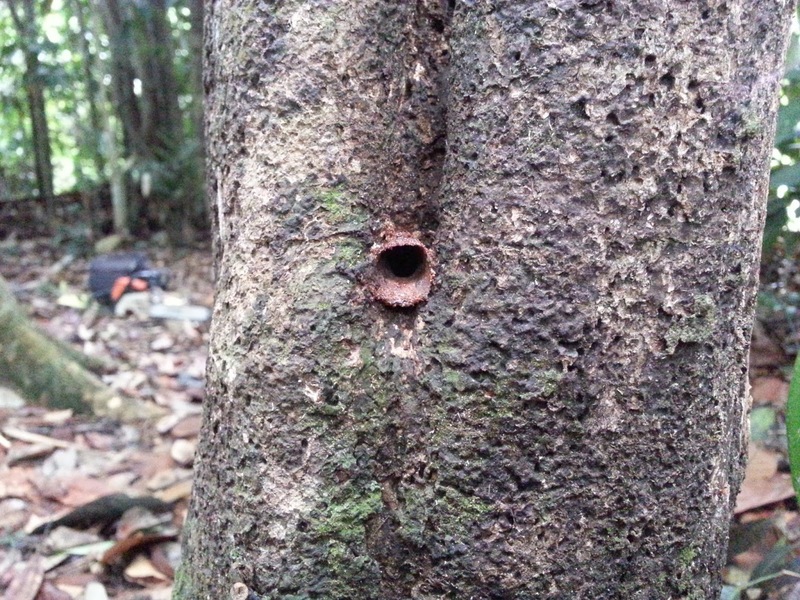 A hollow tree trunk at Botanic Island Two serves well for a stingless bee hive. I have more time to study wild bees population at the park now. Its one of the advantages of having conserve the wilderness in the park. I am on my new journey to find out more about these interesting insects. My focus is on the stingless bees (melipones), which are naturally plenty in the park, are not harmful and can be kept as pets. They come in various sizes and so far I have managed to keep three species for propagation purposes. I am considering also to add more species by getting them from outside origins and introducing them to the park. As starters and teasers here's some pics I took recently. 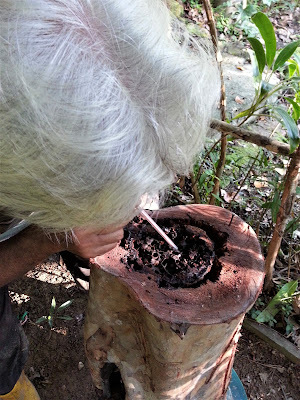 Sipping stingless bee honey which has a sweet and sour taste directly from its honey pots. Busy like a bee. Stingless bees moving house, finding a new man-made home. Ripe fruits of Physalis minima or 'Letup-Letup' in Malay. There are plenty of ripe berries of the Physalis minima at the park right now. This plant though imported a few of years ago to the park seems to like the environment here and are 'self-propagating' naturally through its ripe seeds. It requires very little maintenance though a good dose of fertiliser would surely make the stems stout and more fruit-bearing. When available the berries make good menu for vegetable salad for they taste very much like tomatoes (see below).